Thank goodness–Iraqi kids are, at long last, watching crummy educational cartoons. CNN reports. Hmmm. A company called Zazzle has teamed with Disney and the Post Office to offer custom Disney stamps in–they say–over 3,500 designs. Want to send all your correspondence using Emperor’s New Groove postage from now on? No problem. Zazzle, which specializes in custom-printed stuff of all sorts, also offers T-shirts with more than 200 different Harvey Comics-related motifs (Jackie Jokers fans, rejoice!). Actually, you can print Harvey characters on an array of tops, in tons of colors, with custom text–if a pink Baby Huey camisole with your name on it is what you crave, it can be yours. Sadly, Zazzle doesn’t seem to sell any Harvey-themed stamps. Or am I the only one who would use Little Dot commemoratives if they existed? What’s that? You’d like to see something strange that has nothing to do with Scrappy? Glad to oblige. 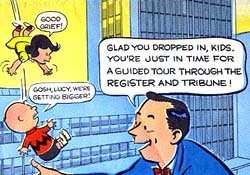 For the first time in a dog’s age, I’ve added a new page to my Harry’s Museum section–a complete reprint of a bizarre 1957 comic in which Charlie Brown and Lucy tour the Des Moines Register and Tribune offices and plant. I’ve never seen this story (most definitely not by Sparky!) mentioned anywhere. And if serious Schulz fans would prefer to forget it existed in the first place, I wouldn’t blame them–even though I find it fascinating. Click here to read it. Self-serving plug: I’m selling this, and a random assortment of other items (mostly not related to comics) on eBay at the moment. (I’m trying to weed out the clutter around here.) Click here to see my listings, should you care. Paul Dini’s new blog has some extremely intelligent musings on Tim Burton’s Charlie and the Chocolate Factory, which denies it’s a remake of what may be my favorite movie of all time. Also up at the moment are numerous early Blondie dailies, including one from the famous hunger strike sequence, several Segar Thimble Theater strips including this one with the Sea Hag, and three Herriman Krazy Kats (here’s one of them). This Batman cover by Fred Ray and Jerry Robinson is nothing to sneeze at, either. And I’m just scratching the surface here. If the stuff there at the moment were a museum, it would be as good a comics museum as I’ve ever seen. Pay it a visit. 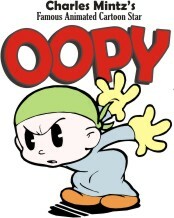 This doesn’t look like the Oopy I know, but there are many, many Scrappy cartoons I haven’t seen. So I’m not saying it couldn’t be him–characters in Scrappy cartoons tended to morph from year to year, cartoon to cartoon, and scene to scene. Anyone out there have any opinion on who this is? Could it be some random supporting player from a Scrappy cartoon? Posted by HarryPosted on July 23, 2005 Leave a comment on Do You Know This Boy? On Saturday at this year’s San Diego Con, I came dressed in a Scrappy T-shirt. No, they’re not selling them–though they certainly should. I was forced to make one myself with one of those iron-on transfers you can run through an inkjet printer. I continued to enjoy myself during the San Diego Con’s final two days, visiting with (among many others) Amid Amidi, Jerry Beck, Nick Cardy, Milt Gray, Matthew Hasson, Nick Hofmann, Andrew J. Lederer, Bob Miller, Jerry Robinson, and Brent Swanson. One panel highlight: Mark Evanier and Earl Kress’s interview with Gary Owens. He doesn’t just play a talented wacko on TV–he appears to be one in real life, too. Odd moment: Having dinner at a restaurant near the convention center and sitting next to a man who we later learned was Kenny (R2D2) Baker. My favorite con purchase was a J.C. Penney’s back-to-school sign featuring Scrappy and Margy. Another relaxing and entertaining day here in San Diego, but the highlight didn’t come until about 10:45pm, during Jerry Beck’s “Worst Cartoons Ever” program, when I sat in an audience of several hundred people and watched a Bucky and Pepito cartoon provoke fairly raucous laughter. This was not the first time I’d seen animation fans weirdly transfixed by B&P. 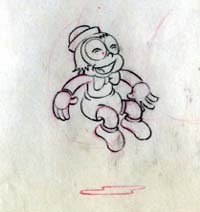 In about 1993, at the Cinefest convention in Syracuse, I bought a $10 reel of 16mm cartoons which included a Bucky and Pepito. It was from a series I’d never heard of, about a cowboy kid and his Mexican pal. I showed it that night in my room for a small, startled audience. The B&P we saw tonight–The Vexin’ Texan–was new to me. And it was, I’m pleased to report, terrible. Aside from the trip down here (our plane ran short on gas and needed to make a side trip to Ontario, California to fuel up), my visit to the San Diego Comic-Con is off to a good start. 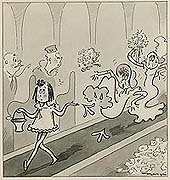 I’ve had fun chatting with folks like Jerry Beck and Earl Kress, enjoyed Mark Kausler’s wonderful It’s the Cat and Martha Sigall’s talk about her career, and bought–cheap–what purports to be a drawing from a Scrappy cartoon. The endless dealer floor kind of feels like a retread of last year’s edition–same massive booths in same locations hawking same products–but as usual, much of the fun for me comes in just looking at stuff I’m not actually buying. Among the things I’ve run across are a 1930s membership card in the National Popeye Club, a poster for a silent Felix, and a jaw-droppingly great four-drawing sequence from Mickey’s Polo Team, with Mick, the Goof, the Big Bad Wolf, and Charlie Chaplin involved in a furious chase on horseback.